EH! Magazine Party with 20 yang anggun & disenangi 2013 + GIVEAWAY Party Tickets for my readers!! Do you know that EH! Magazine will held a Party call "EH! 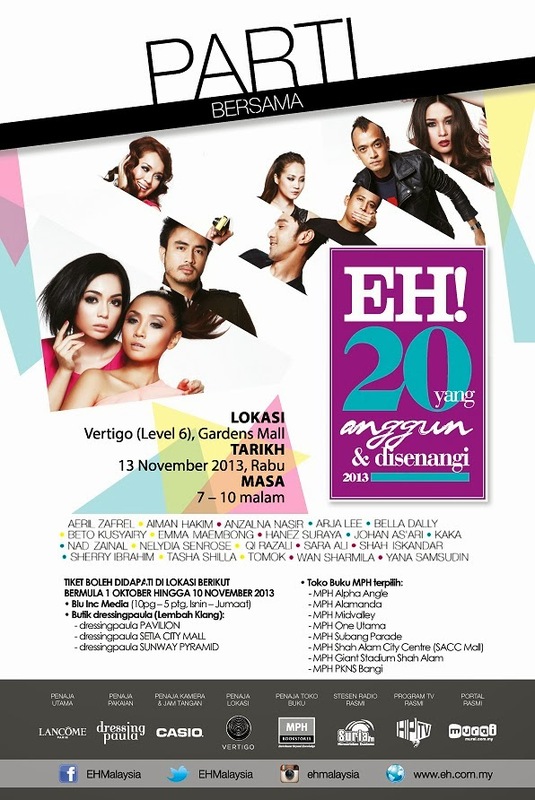 20 Yang Anggun & Disnangi 2013 Parti" ..This Party will be held at Vertigo Club, Gardens Mall on 13th Npvember 2013..This is the 14th party for EH! Magazine.. The reason for this Party is special for all EH! Magazine readers to mingle with the local celebrities..
On that night there will be a performance, fashion shows by the sponsors Dressing Paula and Casio and many more...This is the time for you to catch and mingle out with your favourite Local Celebrity, snap some photo or more and directly speak with them..
How to join the Party??? It is simple and easy as 1 2 3 or A B C..hehehee..
Where you can Buy The Ticket??? You can get TICKETS starting on 1st October until 10th November 2013. The first 200 early birds with tickets who arrive at the party will receive a goodies bag each! Say What!! Be early then.. Here some GOOD NEWS for all My Beloved Readers and Friends.. I will be giving out 5 passes/tickets for free to my readers..
How you able to WIN This Ticket?? WHY YOU WANT TO GO TO THIS PARTY ? WHICH LOCAL CELEBRITY YOU EXCITED TO MEET ? to many question?? It just that I want to know do you really excited to join this party..hehehee..
and I will randomly select The Lucky Winner..the more excited you are, the more high chance to win..hihii..
make sure that you are Free at that night and able to join this party.. 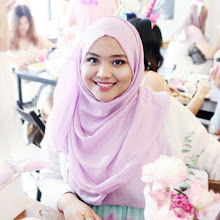 I bought this Blouse from D'yana Boutique that is Blouse D'yana Delia..The simple blouse from D'yana is suitable for a smart look when worn with pants and for casual occasions too.. Using colour-blocking its colour is contrasted with the colour of its collar and the border of its fronts and cuffs..It is also suitable to pair up with maxi skirt (straight/mermaid cutting) gonna help you to look more gorgeous and feminine ..hehee..
Because of the cutting for this blouse is narrow at the waist and wide at the hip area..It is suitable for everyone especially for those who in plus size..this cutting going to make you look more tall and slim..There is some tricks I share with you girlss..hehhee...the colour that I choose is Turquoise with purple at collar, front border and cuffs..This blouse also available in all sizes from 38 to 48 size.. yeayy me! !..and the Price is RM79 only.. 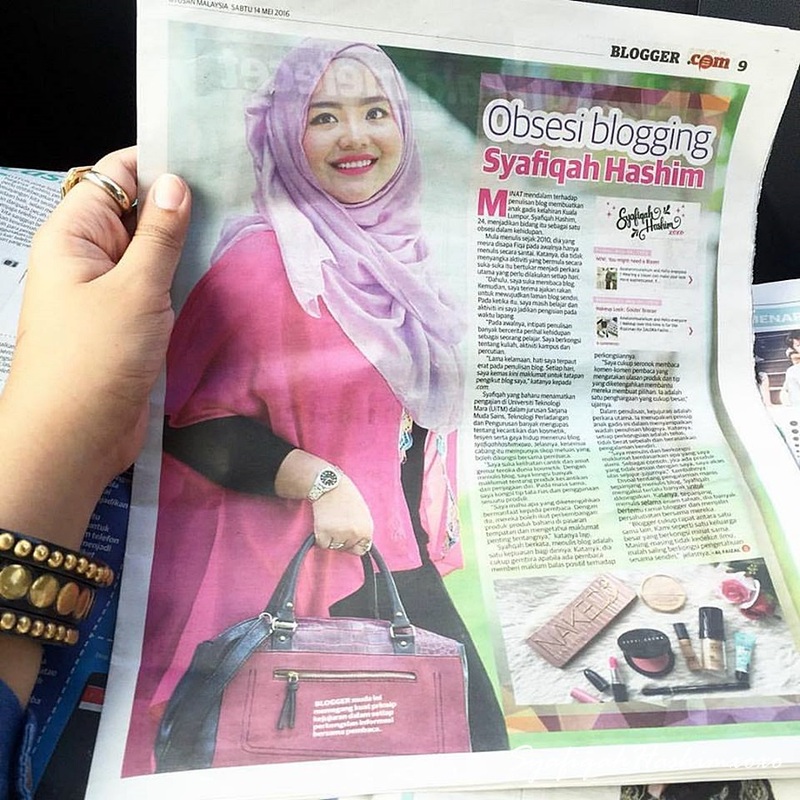 Grab yours now at www.dyana.com.my or you just can drop off at their boutique at Wangsa Melawati.. I know that everyone knows (especially the makeup junkie) that SEPHORA has opened their New Store at Sunway Pyramid!!!! I bet everyone has been to Sunway Pyramid and it is among the focus location for shopping..
Sephora is full with value beauty, driven by the demands of bold, excellence, energy and freedom..It represents a contemporary concept that heightens the desire to live and dream about beauty everyday!! Sephora bringing The Anthology of the best world's best brand to your fingertips..and known for discovering creative brands, highlighting trends..Sephora is an experience total freedom to walk-in, feel, dream, experiment and leave without feeling obliged to make you purchase..All product are authentic and original and its come with beauty.. I uploaded a few (or more) picture on my Instagram..
now I will story more about this Sephora Sunway Pyramid Opening..
we were waiting for The Runway to go to the Sephora New Store..
meanwhile we were entertained by a few performance and fashion show..
we were escorted by this beautiful ladies with the beautiful outfit (costume) they wearing.. This beautiful ladies all using makeup sponsored by Sephora..
the main entrance to Sephora Store.. I bet you can't close your eyes (especially to makeup junkie) and you wish you can have them all in your bad room or maybe you wish to have your own makeup/beauty room!!heheheee.. 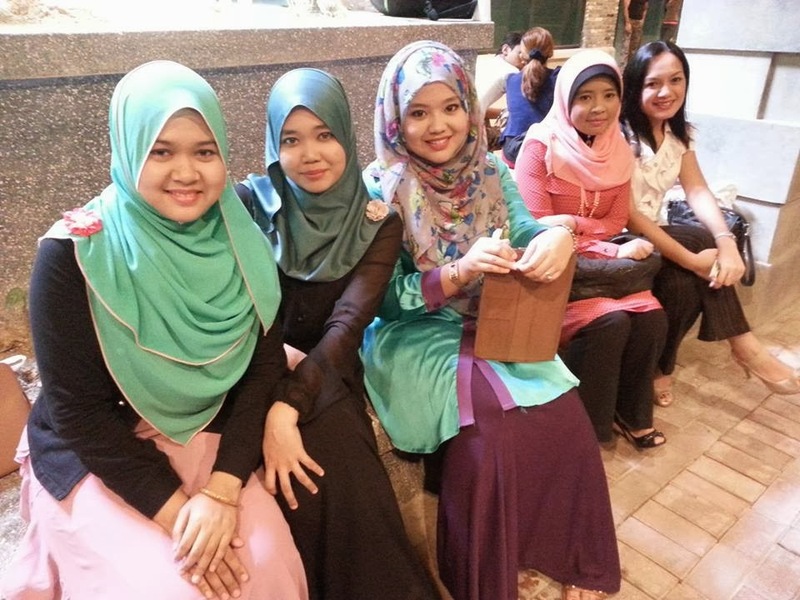 we were given RM100 Sephora Voucher that night and we have to spend the voucher only for one night since it is valid only for the special night..I was like jumping jumping on my own..eventho I can't really Jumping with my heels (5inch) on..cause I can't barely stand on those heels for an hours..HAHAHAA..
what I choose to buy with this Gift Voucher was Lipstick, Eyeshadow and Pencil Liner from Sephora.. Thank You akak, siap sempat balik rumah akak ambil purse lagi..huhuhuu..
with one of the Sephora staff..all staff were so happening and friendly..they will guide us and show us some product according to our desire and types that suitable for our skin..rather than that, they also show us the most Best Selling product on Sephora..Now I know what I should really buy..heheheheee..
we back with Sephora gift and our shopping stuff at Sephora.. Thank You to Sher for this invitation..and thank You to Kak Suzai as well!! They really make my night go blinggg~~ hehehee..
you can leisurely go there and grabs your favourite makeup, skincare, and body care product at Sephora NOW!!! This is my very first experience to acting..means acting for a Telemovie.. Thank You to Kak Asyik and Abg Gorgioo (The Izas Couple) to invite us blogger to join this really great experience..
Telemovie Kisah Sebenarnya Bibah is from Kasih Picture Production.. The lead actors for this Telemovie is Siti Salehah, Pekin Ibrahim and Tengku Nurhanis..This is among the good actors in Malaysia..Glad we had a chance to meet them in person..
what is the story all about..what roles the actors play and others..
All the blogger were focus listening to the briefs and excited to play some roles..hehehee.. I think she play a lot of roles..hehehehee...nampak banyak la muka kak asyik nanti dalam cerita ni..
just simply walked pass through and acting like we're having some conversation..heheehee.. I was walked pass though Siti Saleha tu jewww..heheee..
some silent action I guess..hehehee..
and This place so beautiful..with those colourful umbrellas as a roof .. I just saw this on Wallpaper but never though that this place existed in Malaysia..SO,It does! SEE!! Malaysia Actor Pekin Ibrahim play as hero in this movie..
Pekin really friendly and humble in person..
she play as heroin in this movie and her character is Bibah..so basically we know this story is about her because of The Telemovie title..heheheee..she very cute and talented actress.. Honestly, I'm glad to know them in person..They all friendly and talkative..selalu je nak sakat-sakat orang ni..hehehee..Add Up my Blogger Friends..yeaaa..Hope we can meet again sooner or later..and please "say Hi" to me if we ever bump together ehh..since I don't have clear eye sight and vision(budak rabun..tiannn..)..hahhahahaaa..
Don't Forget to watch Telemovie "Kisah Sebenar Bibah" this December 2013 on TV9 !! Who know DAISO?? Put your hand up!!!! I bet everyone know Daiso right! shop that sale everything worth RM5.. I went to Daiso at Publika and I bought this ohhsemmmmm Daiso Product that is Daiso Detergent for Puff and Sponge..Basically it is a detergent for clean makeup brushes and sponges..I find it very interesting to buy since I don't really have Detergent or Soap that suitable to clean up makeup brushes..usually I just simple use my shampoo..hahaa..and the brush pun jadi wangi..ngehehheee..but now I have this Detergent that can help me to clean my makeup brushes and sponges.. This is how the packaging looks like! just in a simple hard plastic bottle..the attaction I guess because it is pink label..hehehee..gegirlsssss...but be careful in choosing the product cause you might confuse this Detergent for Puff and Sponge with another Detergent for stains on cloth..So please read the Product label before you simple choose the product..but if you wrongly picked up you still can buy another one since this Product not that expansive to get..
the liquid is a saturated type of liquid compared to water liquidity..so It seem like a real detergent you always use to wash your cloth but this one is to wash your mekeup brushed and sponges.. This is who its looks like when your makeup brushes was immerse in this solution..the Transparent water turns to Colored Water since the impurities are simple removed ..just leave it about 20-30 minute of time you'll find that you brush clean as possible..
6) easy going with the skin and sponges..
8) I find that this detergent suitable for synthetic and hair makeup brushes as well.. Overall, this Daiso Detergent for Puff and Sponge are worth to buy! effectively removed impurities on Brushes and Sponges..and the method to use also simple and save time..
Thumbs Up if you find my review are helpful to you its either to buy this product or not..If there is any comment or suggestion please let me know so I can improve it..
for those who follow me on Intsagram for sure uolss already know that I manage to go to #ChurpOut2013 !!! 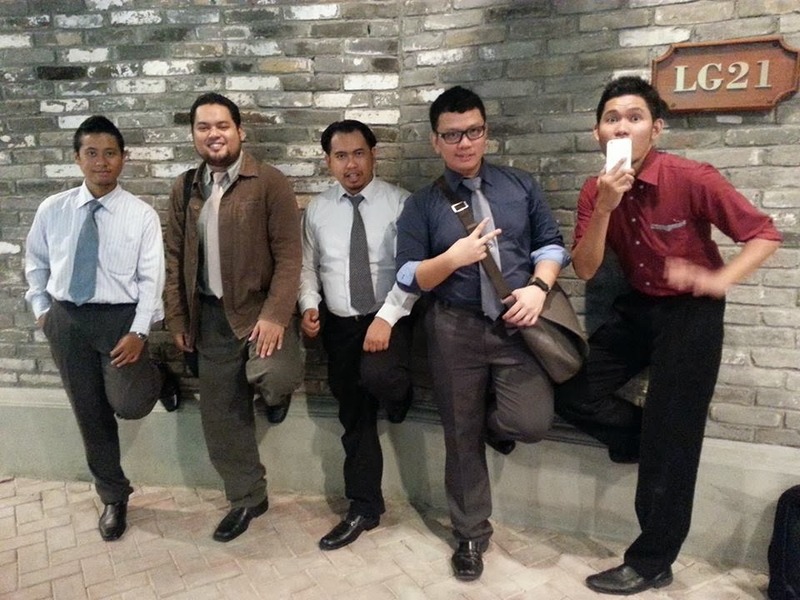 jyeahhhh...!!! This time Churp Out 2013 were held at Setia City Mall..my favourite place for lepakss if rajin laa..heeee..
Hai Cik Fana..still bergaya okeh walupun rumput tu basah..fana pun yakin jalan dengan kasut calaman dia..heheee...pretty!! During this event a lot food stall as well!! I was attracted to this booth because of Siwon Oppa!! KyoChan !!! NEW Korean Chick(en) in town with Super Junior's stamp!! Let's try this out..since this is my first time trying this.. Spotted My Siwon Oppa!!! sarangheooo..hehehee.. The Original flavour was delicious and the Spicy Flavour still delicious but Its to HOT..
since I'm not a fan of Spicy Foods.hehehee..
the price for one box is RM10 for 6pcs of chicken and you can choose you flavour.. This is for "The Hunger Game: Catching Fire" but I donno how this game works..huhuuhuuu..
All Fashionistas are unite at ChurpOut2013 market..
a lot of Online Boutique and piece from Fashion Icon were there..
and I finally had a chance meet Hanis Zalikha.. I was really hoping that I can meet Keknis at ChurpOut..jumpaa jugakkk..she looks like a barbie doll..
the special game and most watch is #ChurpBungee !! and I meet Mek Onie and her friend..
and I meet Darren!! Can't barely recognize him because his face got sunburn lorhh..
but Darren you still look handsome! hehehee.. Sitting like a boss in the middle of outdoor park Setia City Mall.. Thanks to this comfy doof pillow..hehehee..
and There is Giant Bubble as well..
this is the step to play with this bubble..
Churp Out 2013 was AMAZING!! But still I didn't manage to meet all my blogger friends that time..but ramai yang upload photo dorang at Churp Out on Instagram, Twitter and facebook..maybe I was too late..ngeeheee. I can't wait for Churp Out 2014 next year!! !